Just a few days ago google announced the new operating system that is 4.4 kitkat with Google’s new mobile phone device “Nexus 5”. There are many improvements in this new OS that make it a perfect OS of current living time. One thing I mostly like in android 4.4 Kitkat is it is not only compatible with a high-end (expensive) devices but this will also work just fine on low-end devices having a little amount of RAM. 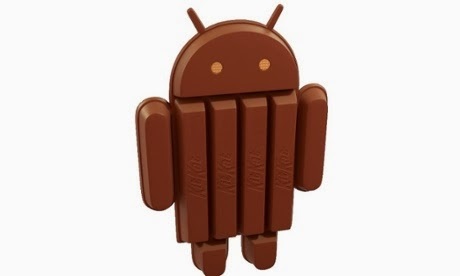 Android 4.4 kitkat should be turn on the devices having a 512mb RAM and will be a better multitasking abilities. Here in this post we’re going to discuss what’s new In Android 4.4 kitkat so let have a look to these features we short-listed below. The notification bar and menu bar can be bring back once again by dragging your finger to upper or down respectively. The new app in the android 4.4 kitkat is future calling which prioritizing your contacts on the bases of to whom you talk mostly. There are also some improvements in unified messaging app, All of your SMS, MMS, conversations or hangouts will be stored in a same app, Additionally it also allows you to send GIF’s and your location. Now users having Android 4.4 kitkat, can print photos, a webpage or any other document if connected to google print cloud, through any printer which have apps in google play store. Android 4.4 Kitkat comes with a screen recording utility that can be used to record your phone actions, and captured video will be stored in as Mp4 format. This will help developers, reviewers, technical writers, to create tutorials for apps, testing materials, etc. Not only above are the features in this new OS, below we shortlisted some others we know about. Better accessibility options: Apps that offers videos, can now access to captioning setting and can adjust the display of the caption as user preference. Enhanced Support For Connectivity Options: It has support for MAP (Message Access Profile) enabling Bluetooth-enabled cars to exchange messages with Android devices. Step detector and Step counter: A built in app which will count your steps while you’re walking. More efficient: Touch Screen response fast. Low-power audio playback: Having ability up-to 6 hours of audio playback. View wallpapers in a full screen with preview. Redesigned Quick Office: Use quick office to edit documents, presentations and spreadsheets from your device. So above we mentioned some best feauters of the newly announced OS Android 4.4 kitkat if you know any additional feature then Don't forget to leave your valuable comment with it and also write down which feature you like in this new OS. Thank you Muneeb Ur Rehman for commenting & appreciating. Use links related to the post only.